Not many people are familiar the company Am General and for good reason, because they were never really a car-maker. AM General was a producer of heavy duty and military vehicles with roots that go back to Kaiser-Jeep. In fact almost no one has heard the AM General name when it came to offer consumer vehicles when they took their military designed Humvee and converted it for sale to the general public. The first AM General vehicle for sale to the masses was the Hummer H1 and the AM General brochures and catalogs are hard to find. The Hummer H1 was like a Jeep on steroids and the desire of every man that wanted power, size and attention. It was over-sized and quite pricey. AM General located in South Bend Indiana started as a bicycle company as far back as 1903 as the Standard Wheel Company of Terre Haute Indiana and then merged with the Overland Automobile Division to build motor vehicles, which introduced the Overland Runabout. In 1908 John Willys bought the Overland Company and it was renamed Willys-Overland Motor, Inc. In the 1940s AM General or Willys-Overland at the time made a name for its self when it produced the 4-wheel-drive military Jeep that was one of the main vehicles used for years by the military since World War II. Later the military Jeep was turned into the Kaiser Jeep that was very popular with civilians and car buyers alike that wanted something different in a vehicle.It would be great to have some of those AM General brochures. The company has very rich history that includes the old Studebaker facilities in South Bend, which eventually became the home of Am General. The actual company of AM General wasn’t incorporated as a stand alone business until 1971. In 1967 the Kaiser Jeep Corporation created a division named AM General to produce military and government vehicles was award a contract to build the DJ-5 Dispatcher for the U.S. Post Office and you can still spot them on the road today delivering mail. AM General builds military vehicles and in the late 1970s it was contracted to develop the High Mobility Multi-Purpose Wheeled Vehicle (HMMWV or “Humvee”). This was the Jeep like vehicle in the 1990s that we saw all over the TV when the U.S. was involved in the Mideast problems with Kuwait and Iraq, but very few AM General brochures. General Motors bought the rights to the Hummer brand name in 1999, and AM General continued to produce the Humvee for GM as the Hummer H1 until June 2006 when fuel prices drastically reduced the sales on large SUVS and other gas hogs. AM General also built a special factory to assemble the Hummer H2 (poor imitation of the H1 in my book), which was based on a GM pickup truck. 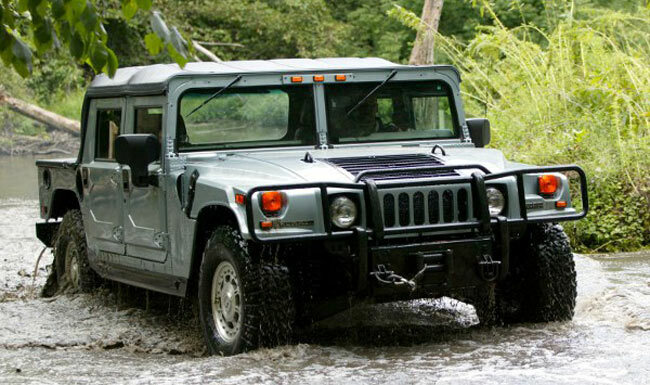 The H2 was produced from 2002 until the bankruptcy General Motors forced the end of the Hummer brand in 2009. Sorry to see it go, but it was fun while it lasted. We don’t have too many AM General brochures, but we have a few. To learn more about the interesting history on AM General you can visit their website here.